In case you didn't already know how much Valve loves Linux, it's pretty much just pledged to love, honour and obey the operating system for the rest of its life. The company has announced that it has officially joined the Linux Foundation, a non-profit organisation that began back in 2000 and aims to boost Linux projects and support developers. 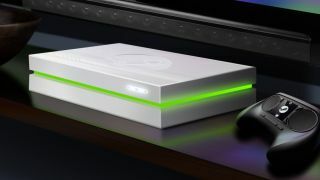 In September Valve announced its Linux-based SteamOS, which will come running on its games consoles, the Steam Machines, next year. Valve's latest move reinforces its faith in the future of the Linux gaming platform. Many future Steam games will be built by users, and Linux's open-source OS will allow them to do this much more easily. Valve's Mike Sartain said that joining of the foundation is "one of many ways Valve is investing in the advancement of Linux gaming." It hopes that the move will encourage other manufacturers to support Linux as well as beef up developer tools and safeguard the future of Linux gaming. Many of us remember Gabe Newell describing Windows 8 as a "catastrophe for everyone in the PC space" back in 2012. Suffice to say that Valve is making every effort to distance itself from Microsoft's OS and usher in a new era of Linux gaming.